prism (ˈprizəm/) n. piece of glass or other transparent material cut with precise angles and plane faces. Prisms are useful for analyzing and refracting light (see refraction). A triangular prism can separate white light into its constituent colors by refracting each different wavelength of light by a different amount. The longer wavelengths (those at the red end of the spectrum) are bent the least, the shorter ones (those at the violet end) the most. The result is the spectrum of visible light, or the rainbow. Prisms are used in certain kinds of spectroscopy and in various optical systems. Netflix is proposing I watch White Christmas. White Christmas is one of the many classics I watched with my grandma growing up. We would often screen films on American Movie Classics in the living room, after she popped popcorn on the stove. I got to know Rita Hayworth and Audrey Hepburn and Gene Kelly and Fred Astaire while curled up on that old brocade couch. I found the stylized nature of these films comforting, conjuring nostalgia for a time I never experienced first hand. The fancy dresses with foundation garments underneath, the finger-waved hair, the three-piece suits and wingtips and fedoras, the inexplicable breaking into song or dance at any moment. These glimpses gave me access to my young grandmother. The one with bright red hair and sweet collared dresses, who was a secretary after attending Washington University in her hometown of St. Louis. White Christmas, released in 1954, features Bing Crosby, Danny Kaye, Rosemary Clooney, and Vera Ellen and is mostly a remake, in Technicolor, of a film made less than a decade earlier: Holiday Inn. Filmed in black and white, Holiday Inn was the movie that first introduced the world to the now-standard holiday song “White Christmas.” In the middle of the film, a cardigan-sweatered Crosby croons “I’m dreaming of a White Christmas” and pauses in playing the piano to reach over and ring the bells that are hung on the Christmas tree with a silver spoon. The 1942 film revolves around two old buddies, Jim and Ted, played by Bing Crosby and Fred Astaire respectively, who used to have a musical act in New York City, who are intensely competitive, and who fall in love with the same woman, an aspiring performer Linda Mason, played by Marjorie Reynolds. Jim starts an inn in Connecticut—the Holiday Inn—that features monthly performances based on each month’s signature holiday. He hires his love interest Linda to perform alongside him. There is singing. There is dancing. There is a friendship strained by the friends’ mutual love of and competition for one woman. There is misogyny and stereotypical gender roles. And then there is the issue of blackness and whiteness. I vaguely remembered the premise but mostly the feeling of sitting with my grandma in her living room when, a few years ago, I rented the DVD from a local video store. I remembered the costumes and the dancing, the coy smiles of this old school romance. I recalled the stunning solo number by Fred Astaire, who tap danced across the floor while throwing down firecrackers for the Holiday Inn’s celebration of the Fourth of July. What I didn’t remember was the performance from Lincoln’s Birthday, which is astonishingly picked as the holiday for February instead of Valentine’s Day. Necessitated by the plot that requires Jim to disguise his beloved so as to ward off advances from his friend and competition, he makes a quick change and the number for Lincoln’s Birthday suddenly becomes a minstrel show. 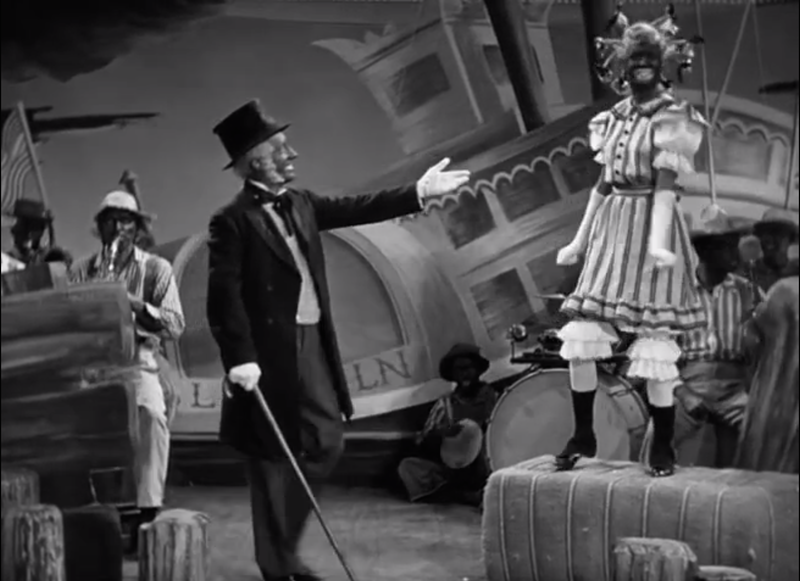 Bing as Jim emerges in blackface with a top hat, beard, and cane. Linda’s face is painted black as well and her hair spikes out into a myriad of ribboned blonde braids. My jaw dropped. I had no memory of this scene at all. And I wondered: Was it because I was too young and had no context for what was happening? Did my grandma see the issues of the scene and choose not to tell me? Did she not see the scene as problematic enough? Did she avoid talking about it with me because of its problematic nature? 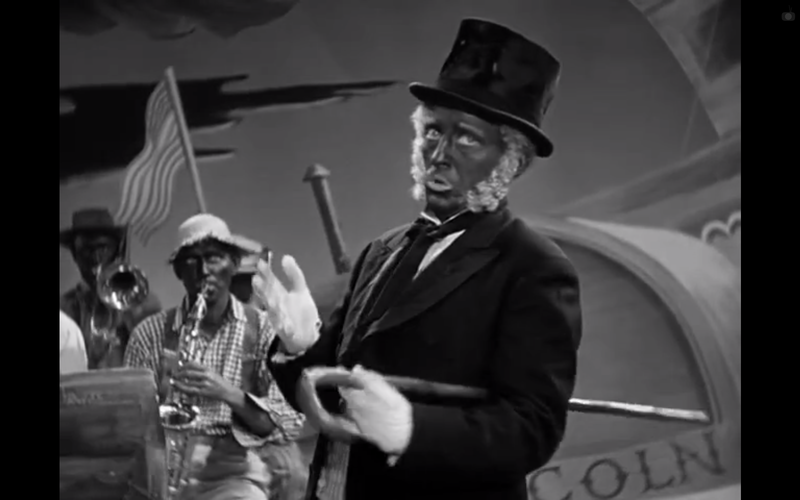 The song “Abraham” unfolds with Bing Crosby singing against a full orchestra also in blackface. The blackfaced banjo player sits in the far back on the ground. The waiters and waitresses are in blackface as well, the women adorned with kerchiefs and petticoated polka-dotted skirts. 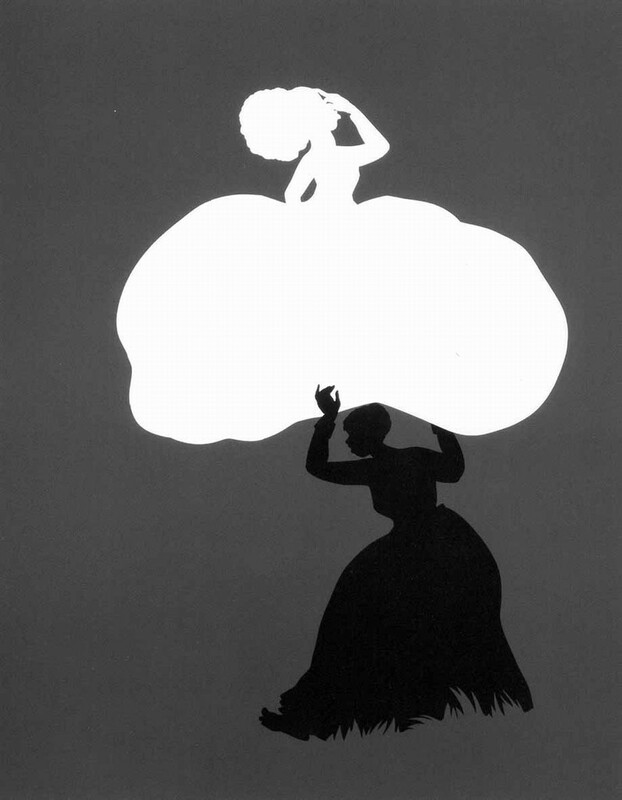 Research reveals that some broadcasts began to show an edited version of the film in the 1980s. (How that worked I’m not exactly sure since this section of the movie also reveals crucial plot points. 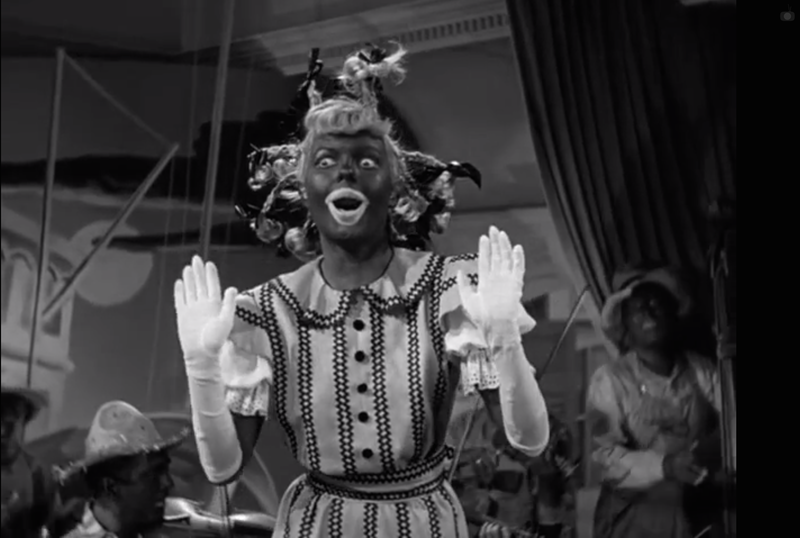 For example, that touching moment when Jim proposes marriage to Linda while painting her face black for the minstrel show.) Turner Movie Classics didn’t edit the film because they believe in broadcasting films as originally cut. And until more recently, American Movie Classics also ran the film in its original form. This all makes me think I saw the original uncut version. As offensive as this scene is, as horrible as it is to think that someone deemed it acceptable to create this musical performance and then use it as a lynchpin in the film, someone made that choice. Many someones. And to revise a cultural artifact that reveals its time, who was in power and what they thought, is dangerous. Revising texts in this way is to pretend that popular culture was not feeding into racist attitudes and actions. But even more dangerous, I think, is the outrage so many white Americans often experience about the past that can nullify or desensitize us to the reality of the present. And our present involves a system that privileges and protects white people over and over again solely because of the color of our skin. Our present praises and makes permissible a system that results in the demoralization, degradation, dejection, and death of black and brown people. Like so many Americans, I have felt devastated and angry this last week about the lack of an indictment of Darren Wilson in the killing of Michael Brown. When I returned home the night of the verdict, my desire to hit something was so strong that I ended up punching my mattress for a while. I felt a sickening feeling in my stomach, a combination of fury and grief, a few days later when watching the video that shows a Cleveland cop shooting and killing 12-year-old black child Tamir Rice a mere second after the officer got out of his car. There is no sound in the video so all you see is a small body standing upright and then crumpling to the ground. Devastating. Not to mention the local news story that led by attacking the character of the victim’s father instead of the confounding fact of an officer killing a child holding a toy gun. These deaths are tragedy accumulated because Michael Brown and Tamir Rice (and Trayvon Martin and and and) are not exceptions but part of a long line of African-American people killed in this country because of the color of their skin and because our country refuses to look at the reality and pervasiveness of the racism that we are founded in and on. We would like to think we are so much farther along than Holiday Inn. But that’s just not true. Only two weeks ago, Jacqueline Woodson was presented with the National Book Award for Young People’s Literature for her book Brown Girl Dreaming, a memoir about growing up in South Carolina in the 60s and 70s, dealing with Jim Crow and the aftermath of the Civil Rights movement. And at this pinnacle moment of her career and artistic work, Dan Handler, the author of the popular Lemony Snicket series, made the joke that he “only just found out she was allergic to watermelon.” I can’t imagine what it would feel like, on one of the most important nights of your life, to have your accomplishments smeared with insults and reminders of the very injustices your work strives to illuminate. Ignorance of history and also denial of the significance of the small things in defining the large ones. A watermelon joke is not just a joke in the face of the history of that stereotype. Last weekend, before the grand jury released its ruling, I read Claudia Rankine’s new book Citizen: An American Lyric. Through lyrical prose about her personal experiences, politics, and pop culture, Rankine explores the perpetual presence of racism in the lives of African-Americans and the extent of the damage it does. On the front cover is a white backdrop with a black hoodie torn from its torso. Can we just think about that for a second? That for his whole life, this child, this mother’s son, this boy then young adult then man, this human being will have to walk the “right” way, say the “right” thing in order to attempt to preserve his life. And even if he does everything “right,” he is still at risk of being harmed or killed solely because of the color of his skin. How many more lives lost? How much more will it take for us to change a system that is harming and killing so many citizens of our country? I understand that, as a white person, my perspective is limited and that I cannot fully understand the grief and anger of black individuals and black communities in seeing this same injustice and violence perpetuated over and over again. I felt myself paralyzed this past week with what to say in relationship to this, wondering when and if I should write anything at all. I grew up in New Orleans, a city segregated by color lines. And without anyone ever needing to really explain the idea of separate and unequal, I saw it everywhere. And what I mostly saw was good-hearted white people pretending that nothing was happening. This is happening. People of color are being killed and oppressed solely because of the color of their skin. This is happening. The criminal justice system is rigged against minorities and people of lower socio-economic status. This is happening. Black kids are being killed while white kids are being given the benefit of the doubt. This is happening. People of color are not “playing the race card,” people of color are being played, by a system rigged to oppress them. I believe that many Americans will look back at this time and be as appalled as we are now by lynchings, by blackface, by Interstates built through African-American communities. That’s not good enough, to hope that one day we will look back and be appalled. Let’s be appalled now. Let’s do something to change this. Before Isaac Newton, people believed that pure light was colorless and that light was “altered into color” from interaction with matter. Experimenting with prisms using refraction, Newton revealed the opposite, that light included within it the whole spectrum of color. That a prism didn’t create color but rather separated it, showing what was already present. In ophthalmology, prisms are used to diagnose and treat deficiencies and diseases of the eye. Ophthalmologists use light reflected and refracted by prisms to examine the eye for vision problems so they can be treated. It is only in altering angles, in finding mirrors, in looking in different ways that problems can be identified, that vision can become clear. Claudia Rankine’s amazing book Citizen.